The SALTO virtual network will not only give you control over who is on site and entering your properties. 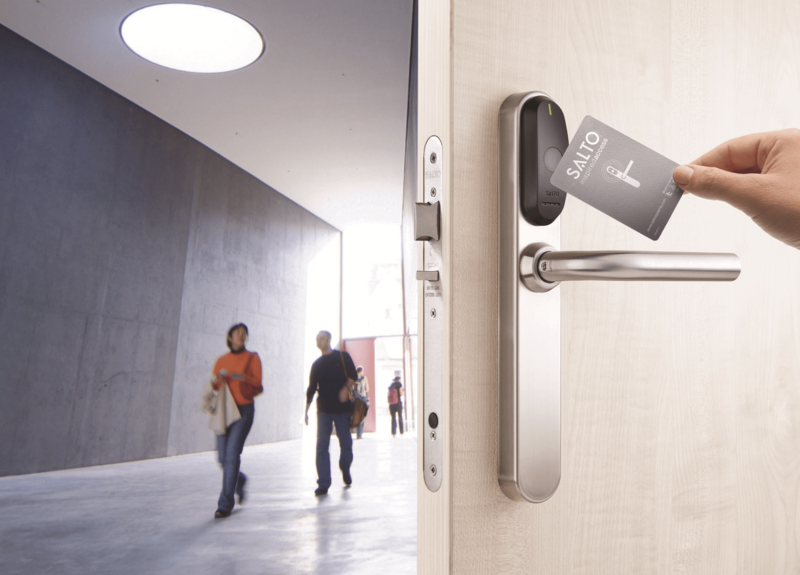 It will give you the flexibility to allow your access control system to grow from a small number of doors and users to a large number of doors and users, as you require. There is no need to worry about your company infrastructure when you choose the SALTO virtual network. The network will allow you to enjoy the many great features that an online access control system can deliver but without costing the earth. It uses state of the art technology, allowing the door locks to read, receive and write information, using an encrypted and secure data-on-card system that utilizes the capabilities of ‘RFID’ read/write technology. In the SALTO virtual network, all data will be stored on your employee’s ‘smart-card’. It’ll enable users to get ‘instructions’ for other doors on the network. So, if a user has lost their card then a central hub will relay this information to the user’s smart-card, and this will disallow the card from accessing any of the doors around the building. The doors themselves can also transmit information through a user’s card, so a door with low power could transmit that information, and it’ll be flagged in the main hub, so a member of the team knows to replace the batteries of the door. The system is also an ‘offline system’, so it won’t require the same amount of intrusive infrastructure work to get it installed as other online systems. Here at Brunel Fire and Security, we’re proud to be a SALTO Systems Service Centre partner, this means you’ll have world-leading technology and our years of experience in security system installation and servicing. This system will give you the protection you require from uncontrolled access with an excellent user experience. We’ll be able to provide and deliver the ideal solution for you, completely tailored to your exact requirements to provide you with the security, convenience and control you need. The whole team are completely trained to an advanced level and will be able to professionally deal with both installations and any questions you may have about the solution. We’ll be able to design you a system that’ll completely complement and enhance your security arrangements and ensure that your building is completely safe. Any company can install a piece of equipment, but when you choose Brunel Fire and Security, you’ll receive a system that’s been designed with your exact specifications and requirements in mind. So, if you’re in need of a security solution for your business, be sure to get in touch with Brunel Fire and Security today on 0117 259 1000. We can arrange a free site survey so that we can recommend the perfect security solution for you. We pride ourselves on ensuring your company is kept completely safe, providing class-leading perimeter protection systems so that you can focus on running your business. Freya is the content writer here at Brunel Fire and Security. She is passionate about the industry and provides our customers with all the information and advice they need.